These bird drawings are a bit different from your typical nature drawings. They are much more than just a simple depiction of several birds... They are portraits that give the birds their own unique personalities, individual identities and spectacular history! The goal of these drawings is to encourage us to rethink our relationship to nature, specifically the way in which we perceive and relate to the other creatures that inhabit this planet with us. Let's examine the drawing Celestia, above left. This drawing depicts a sulfur-crested cockatoo that is grandly posed before an overlapping series of ancient solar system models. 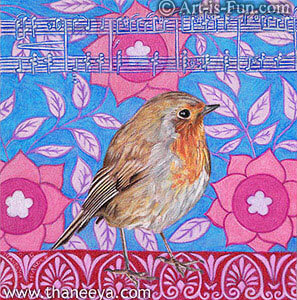 The bird has a regal, stately air, due to the composition, color and design. How does this concoction of imagery alter the way in which you perceive the cockatoo? It probably makes you think, "This is no ordinary cockatoo!" Placing the bird amidst unexpected imagery imbues him with a background story that supercedes our habitual expectations of this feathered creature. This cockatoo now looks like an experienced traveller - one who has explored far and wide, and experienced much more than words can say. Here's another bird drawing on the left, titled Cessate. 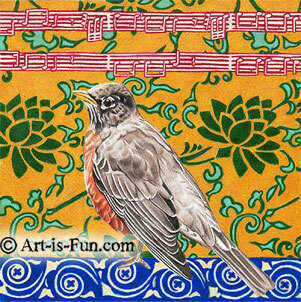 This drawing features a robin perched atop a swirly blue and cream pattern, in front of a richly colored floral background. Above his head is a section of sheet music from Cessate, omai cessate by Vivaldi. This combination of imagery causes the bird to appear quite refined, dignified, and sophisticated. All of these bird drawings were entirely drawn by hand on Strathmore paper using Prismacolor colored pencils (this links to Blick Art Materials, and if you make a purchase I get a small commission that helps support this site) . They are quite small - 6 x 6 inches (15.24 cm x 15.24cm). The amount of detail captured in this small size lends the drawings an air of quiet intimacy. These drawings were built up through many layers of colored pencil, until the surface of the paper was rich and smooth with pigment. Each spot on these drawings contains at least 3 layers of colored pencil. The result is a brilliance and vibrancy very similar to oil or acrylic paintings! For an example of layering, take a look at the drawing below, titled Song. Does that look like a simple light blue background? You may be surprised to learn that the light blue background is comprised of 5 separate layers of color, only 2 of which are blue: first Lavender, then French Grey 10%, then another layer of Lavender, then Ultramarine, and finally a coat of Non-Photo Blue. Adding all of these colors, one on top of the other, builds a rich depth of unique color that you just can't get from using one or two layers of color. The main visual focus of these drawings is the individual bird, who is surrounded by abstract imagery. These drawings combine abstraction and realism to create a colorful delight. The drawings are both thought-provoking and whimsical. "These elaborately detailed drawings are part of my Deep Thinkers series, in which various animals are juxtaposed with evidence of human thought, in the form of mathematical equations, quotes, definitions, musical scores, etc. These pieces depict a zen-like transcendent bridge between conceptual thinking and animalistic consciousness. These two contrasts are united by a careful use of color and decorative design." The images below show the Celestia drawing at different stages of completion. This gives you an idea of the way the drawings are formed. You can see more of my animal and bird drawings at my website! Nature in art can take many forms. Read this in-depth exploration of nature in art - such as what inspires artists to create nature-themed artwork, as well as the various ways they go about it. Making art from nature returns us to our natural roots, bringing the artistic process back to basics. Learn about nature-inspired art and artists! Learn how to draw a rose! Learn the steps to creating your own rose pencil drawings using basic supplies you have around the house.